Arab Computers are offering a new promotion. 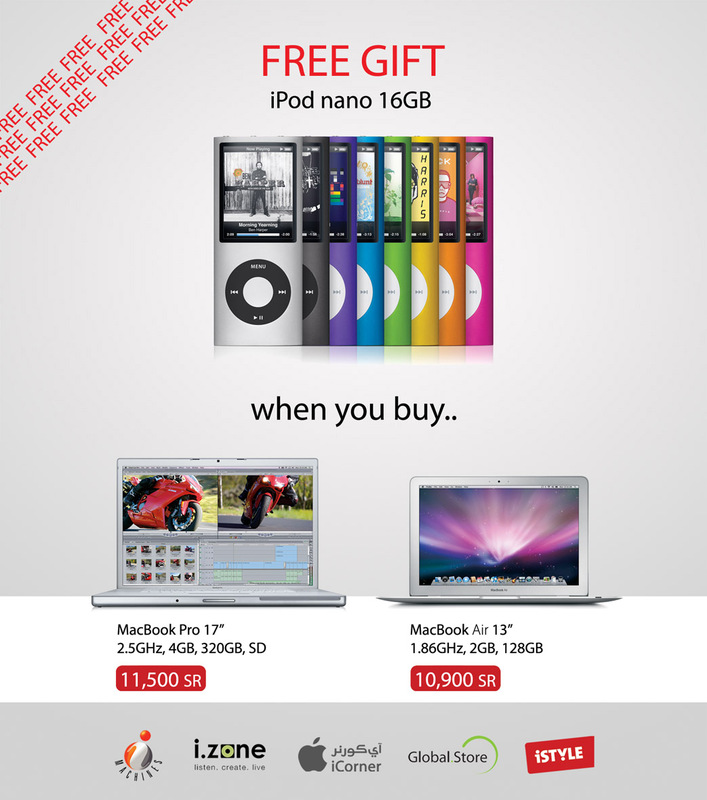 Whenever you buy a MacBook Pro 17″ (2.5GHz, $GB, 320GB, SuperDrive) 11,500SR or a MacBook Air (1.86GHz, 2GB, 128GB) 10,900SR you will get a free iPod nano. You can find more information about the hardware used in this promotion from this post. But it seems that the offer is on the old 17″ MacBook Pro. At least, this is what the image says. Am I right ? Hi Guy, I am going to buy a Mac machine system but, I’m a little bit aware as I have been told that I can’t run Microsoft application like the office and so on. Apart form the Arabic language witch is not supported Can you get me an advice in this regards? a Mac can’t run Windows applications, but the Mac can run windows (either booting or a virtualized version). Also MS released office for mac, but no Arabic. blame MS for that.